Gerard Doherty and his teammates celebrate his penalty save at the end of a pulsating cup tie. 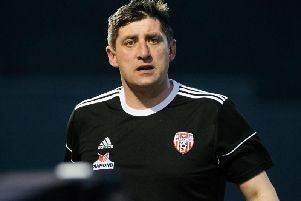 BIRTHDAY BOY, Gerard Doherty produced a dramatic penalty save deep into second half stoppage time to ensure Derry City progressed to the quarter-finals of the FAI Cup. Kevin Toner of St Patrick's Athletic challenges Gerard Doherty of Derry City during the Irish Daily Mail FAI Cup Second Round match at Brandywell. The experienced goalkeeper saved St Pat's midfielder, Ian Turner's 95th minute spotkick with the last action of the match to keep intact City's 1-0 lead after substitute, Adrian Delap gave the home lot a 81st minute advantage. Delap's substitution was an enforced move from Kenny Shiels as striker Ally Roy retired with a shoulder injury 54 minutes into the match but it proved an inspired one as the 19 year-old Irish Colleges and Universities midfielder bundled home the winner with nine minutes remaining in this pulsating cup tie. St Pat's had the chance to send the game into extra-time in the final minute of second half stoppage time when Simon Madden was fouled inside the area by Dan Seaborne but City skipper, Doherty guessed right and produced his second penalty save against the Saints this season to spark wild celebrations. It was Derry City's third victory over the men from Inchicore on Foyleside this season but this will no doubt be the sweetest for team boss, Shiels as his bid to qualify for European football for a third successive year remains intact. Conan Byrne of St Patrick's Athletic winning a header in the box. Shiels had made two changes from the team which lost at home to Waterford last Friday night with Jamie McDonagh and Ben Fisk preferred to Gavin Peers and Aaron Splaine who dropped to the bench. Meanwhile, St Pat's were unchanged from the team which held champion Cork City to a draw at Turners Cross last Sunday. The visitors started confidently and when Dean Clarke got past McDonagh on the right side of the home side's penalty area the City right back clipped his heels on the edge of the box to gift the Saints a promising free-kick after three minutes. It was a glorious chance for St Pat's to test Gerard Doherty but Conan Byrne sent his curling free-kick harmlessly wide of the far post. Byrne then got onto the end of Ian Bermingham's inswinging corner kick but headed wide at the front post under pressure. The Dubliners were controlling the early stages but from a quick counter attack on 18 minutes Ben Fisk ran unopposed before testing Brendan Clarke with a decent right footed strike the Saints stopper turned behind for a corner. Derry began to warm to the occasion less than 10 minutes to go before the break and Clarke was called into action twice in the space of 60 seconds. McDonagh laid the ball perfectly into the path of Aaron McEneff who got in behind the Saints defence but his low strike was blocked by the out-rushing Clarke. City kept the ball alive and when it came to Rory Hale, the Belfast man's 25 yard strike was palmed over the bar by the Saints keeper. From a free-kick wide on the right, Fisk found the head of Dan Seaborne at the far post but his cushioned effort went wide of the mark on 40 minutes. Derry came closest to breaking the deadlock five minutes after the restart when Rory Hale found McEneff's run with a terrific ball, however, the midfielder's shot fizzed across the face of goal and went wide. There were shouts for a handball from the home support when Seaborne's header from a corner bounced up and hit the outstretched arm of Dean Clarke but referee, Neil Doyle was unconvinced. With the game looking to be heading towards extra-time Derry edged in front with just nine minutes left on the clock. After a quick break substitutes Splaine and Delap combined on the edge of the box with a neat exchange with the latter bundling the ball home as Clarke and two Pat's defenders challenged him eight yards from goal. The Saints pressed for an equaliser in the dying embers of the game and ex-Brandywell favourite Simon Madden peeled off at the back post to latch onto Kevin Toner's cross but volleyed high and wide. There was drama right at the death as Dan Seaborne was adjudged to have brought down Madden inside the penalty are and the match official pointed to the spot. Up stepped Turner in the fifth minute of stoppage time in a bid to keep the tie alive but his spotkick was saved superbly by the foot of Doherty - the second time this season the City skipper saved a Saints penalty late in the game this season! It was a deserved win in the end for City who march on in their bid to reach two cup finals this year and in the hope of achieving European football next season. Derry City: G. Doherty: J. McDonagh, D. Cole, D. Seaborne, K. McHattie; Ronan Hale, B. Fisk (S. McNamee 90), R. Hale, D. Shiels (A. Splaine h-t); A. McEneff; A. Roy (A. Delap 54); Subs Not Used: E. Grimes, G. Peers, E. Toal, C. Farren. St Pat's: B. Clarke, S. Madden, L. Desmond, K. Toner, I. Bermingham;D. Clarke (M. Leahy 86) R. Brennan, J. Lennon, C. Byrne (I. Turner 77), A. Campion, C. Clifford (K. Brennan 86); Subs Not Used - B. Murphy, M. Barker, D. Markey, J. Keegan.